Island Peak climbing trek starts from Lukla (2,840m). The Nepali name of this peak is Imja Tse. In 1952, it was named in English as Island Peak by Eric Shipton’s party who thought it to be reminiscent of an Island in a sea of ice. The Island Peak located between the Mt. Lhotse and Imja glaciers is an extension of Lhotse Shar (8,400m). Although the summit can be reached in a day from the Island Peak Base Camp, we climb by the standard route to make use of a high camp. From the peak, we see wonderful views of many Himalayan giants, including the huge south face of Mt. Lhoste (8,516m) and the peak of Mt. Ama Dablam (6,812m). 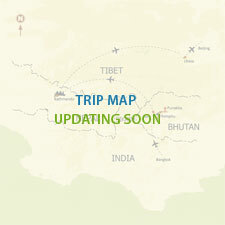 Climbing/trekking Leading Person: Our climing/trekking guide will lead the whole trip with his/her helpers and porters. 1. If the balance payment is not paid before your departure for climbing, the booking will be cancelled without any refund.